To all avid anglers: Ever loved fishing so much you just want your life to revolve around it? Well, here’s an idea. The deep sea anglerfish , Melanocetus johnsoni, literally does that by having the rod, line and bait all integrated into its body. Going where no other line or bait can ever reach, this angler dwells in the lonely, lightless bottom of the world’s oceans, at a depth of a few thousand feet. 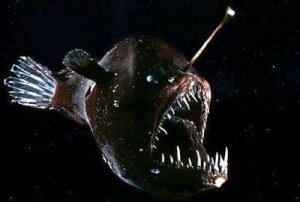 The deep sea anglerfish is one of the 200 over species of anglerfish that can be found in the world, all of which possess this angling skill unique to their kind only. These bony fishes are named for their characteristic mode of predation, where they use an elongated dorsal spine sprouting from the middle of their head over their eyes as a rod and line, and the fleshy growth at the tip of this spine as bait to lure prey in. Such an action resembles angling, hence their name. The deep sea anglerfish typically have at least one of these long filament spines; these are the spines from the anterior dorsal fin. In most anglerfish species, the longest filament is the first (the illicium), and that is where the fleshy growth (also called the esca) used to bait prey can be found. This illicium can be moved around in all directions, and the deep sea anglerfish cleverly manipulates this movement in such a way that the esca resembles a worm (or any other prey animals). Their jaws, which can be extended up to twice their body size, are then triggered to react upon a prey contacting their esca. In this way, their next meal is lured close to their mouths, and devoured whole in a swift action. Here is a videoclip depicting how the anglerfish “fishes” for its prey. 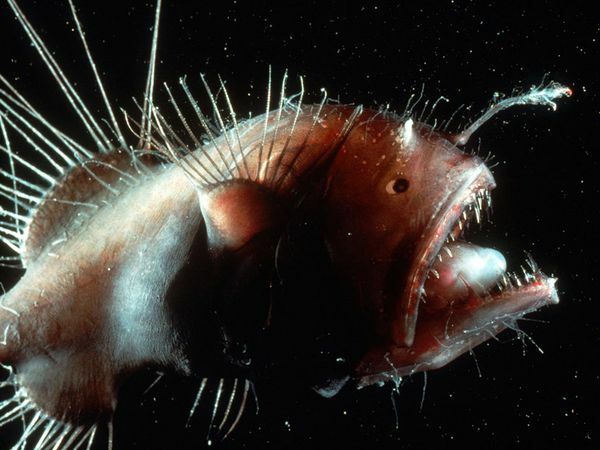 In the near-lightless conditions at the bottom of the ocean, the deep sea anglerfish emits light from its esca to attract and lure prey. This light is blueish green, and is produced through a chemical process known as bioluminescence by bacteria housed in the esca. 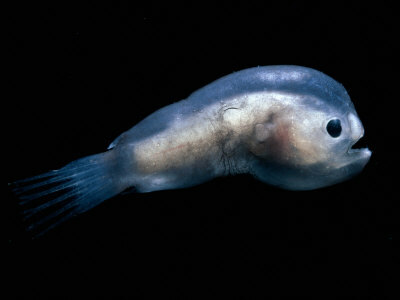 In some species of anglerfish, their organs or other parts of their bodies emit light as well through the same process. At this point, i guess i would have to burst the bubble of all avid male anglers by saying that the best anglers of the year goes to the females, in the context of the deep sea anglerfish. Across all anglerfish, this distinctive dorsal spine or illicium, and esca, are features that belong only to the females. The males do not have them. 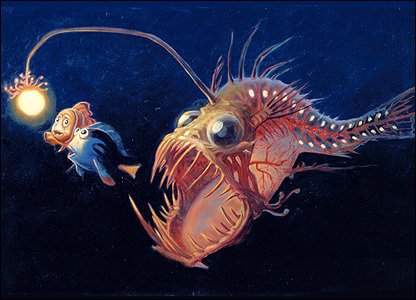 The male anglerfish is significantly smaller than the female, and completely different in appearance. What is interesting to note is that when a male anglerfish matures, its digestive system degenerates and it cannot feed on its own anymore. Therefore it has to find a female or die of starvation. The male angler uses its small hooked teeth to latch itself onto a female, at the same time releasing an enzyme that dissolves the skin of his mouth and that of her body. The two become fused together and their blood vessels join as one. The male, now inseparable from the female, acts as a parasite and gets all of his nourishment from her body. A female can as many as six males on her body. Such a behaviour ensures that when it is time for the female to spawn, she has a mate by her side made readily. The features and characteristics of the deep sea anglerfish certainly makes this angler both weird and unique. Their well developed angling techniques and efficient natural angling equipment has enabled them to stand out as outstanding anglers. At the same time, their grotesque appearance and scary features have earned them the nickname “common black devil”. Well, one thing is for sure. I wouldn’t want it as a nightlight! 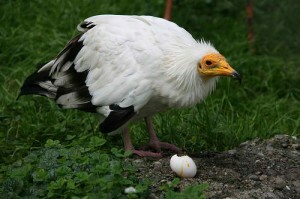 “Feed off the embedded ticks on his hide, chirp when the predators come. Feed off the embedded ticks on his hide, chirp when the predators come. Where’s the passion, the heat?” the tickbird continued. Amusing article aside, it is true that rhinos and tickbirds may not get along as well as you think. The diet of tickbirds, also known as oxpeckers (family Buphagidae), consists of parasites such as ticks. These parasites are in abundance in the hides of large mammals. Thus tickbirds are often found on the backs of these large mammals, pecking away. 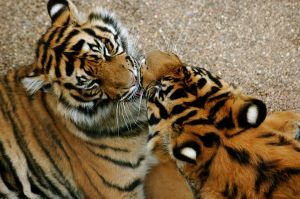 On the surface, both animals benefit from this relationship. The oxpecker enjoys a guaranteed source of food, while the host mammal is rid of parasites. According to Wikipedia, this is a symbiotic relationship! We trust Wikipedia, right? However, it is not clear if the oxpeckers even reduce tick loads. More after the jump. Just A Stone’s Throw Away…. Most people if asked such a question, would probable answer that humans (Homo sapiens) kiss simply because it feels good. Well, yes, it does but scientists (philimatologists) who study the evolutionary history of kissing will probably not be satisfied with just that answer. Thus far, while there has been no conclusive reason as to why people perform this act of saliva trading, it is believed that kissing is a behavior that is both instinctive and learned. For those who deem kissing to be part of our nature, other animals have been cited in support of this behavior. One of the most concrete proofs is from that of the Bonobos ape, the most human-like of all apes, which have been observed to kiss each other to offer comfort, to make up after fights and sometimes, for no seemingly special reason at all. Then there are others who support the idea that kissing is learned rather than instinctual because it is a fact that not all human beings actually engage in acts of kissing – certain tribal groups in the world doesn’t and for those who do, kissing was first observed as an act carried out by mothers to pass chewed food to their newborn, toothless infants. Today, a generally accepted theory as to why humans kiss is that as people move their faces close together, our noses are subconsciously sniffing each other out and our pheromones would exchange biological information in order to determine the suitability of each other in becoming mates to produce a stronger offspring. It seems that people prefer someone whose scent “tells” us that his/her genes have certain immune system proteins that are different from our own thus a union of these two sets of genes could possibly bear an offspring whose immunity would be even stronger. Still – scientific reasoning aside, I’m one of those believer that with the tones of nerves present on our tongues and lips, kissing is simply a pleasure that we get just we try delicious food so who cares really why humans kiss? Be it the African Savannah elephants (Loxodonta africana), the African forest elephants (Loxodonta cyclotis) or the Asian elephants (Elephas Maximus), they have in general displayed intelligent behaviour in many instances. In an article published by The Nature Institute, intelligence was defined to be “the capacity to meet new and unforeseen situations by rapid and effective adjustment of behaviour” (Holdrege, 2001). Basically, from many anecdotal evidence and several experiments involving elephants, these giant land animals have shown us that they have the flexibility to adapt to new situations and the capacity to learn new tricks. If you need some visual proof, check out this video of Elephants revealing new trunk tricks caught on camera by a BBC team. 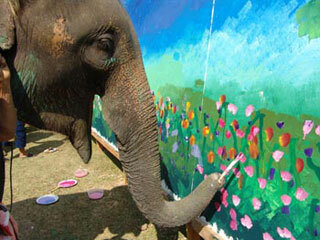 It was after viewing the video, that I became extremely curious about why elephants are so intelligent. In the article, Elephantine Intelligence, Holdrege explains the anatomy of the elephant’s brain which is the largest of all land animals, weighing on average of between nine and twelve pounds. But it is not just the massive size of the brain that makes the elephant intelligent; it is mainly related to the extensive convolution of the brain and the enlarged olfactory lobe, cerebellum and temporal lobe of the cerebrum (Holdrege, 2001). If you were already familiar with other intelligent capabilities of the elephant, such as its ability to use tools to achieve many goals, did you notice that the main organ through which the elephant expresses its intelligence is its trunk? It is remarkable how elephants use their trunks to perform simple yet amazing feats like picking up a stick to scratch itself in places its trunk cannot reach, deliberately throwing sticks and stones at each other during fights or play (Holdrege, 2001) and modifying branches to use it as a switch to protect themselves against flies (Hart, 2008), and the list goes on. Other impressive talents of elephants include its long-term, extensive memory, its ability to empathize and recognise itself in mirrors. In fact, this ability to show self-awareness has thus far been documented to be found only in humans, great apes and bottlenose dolphins (BBC News, 2006). Recently, they have been noted to be able to paint as well. Just take a look at the picture below! Impressive, isn’t it? Yet, the authors of the journal article ‘Large Brains and Cognition: Where do elephants fit in?’ do not seem to agree. They described the performance of elephants in the feats of tool use, tests of insight behaviour and visual discrimination learning to be ‘unimpressive’ compared to chimpanzees or humans (Hart, 2008). Nevertheless, the article acknowledged elephants’ ability to empathize as being unique to the elephant species, excluding humans.